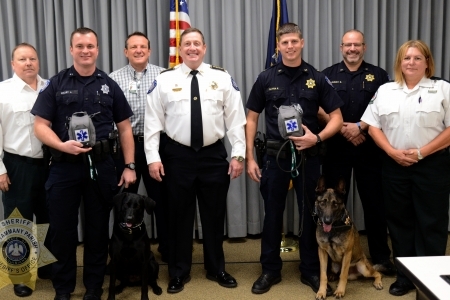 Acadian Ambulance Service has donated seven K-9 field trauma kits to the St. Tammany Parish Sheriff’s Office. 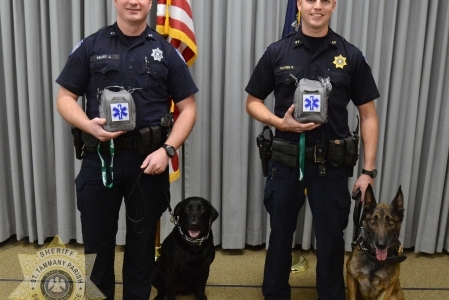 The trauma kits will help handlers provide first aid to their K-9 partners, in case of any immediate medical emergencies they may encounter while on duty. 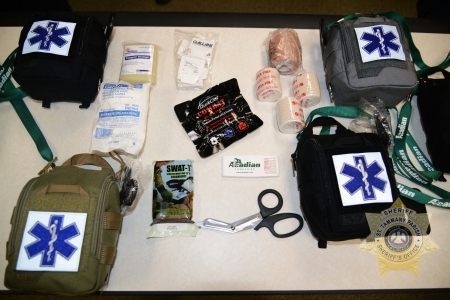 Each kit comes in a tactical-style bag that can be attached to the handler’s uniform and contains dual purpose items that can be used to treat injuries to both the handler and the K-9 in the field. Those items include various types of gauze and bandages, medical-grade scissors, a tourniquet and medication to induce clotting at a wound site. Each kit is valued at approximately $100-150 dollars. The kits are designed to enable handlers to provide that lifesaving treatment to injured K-9s until veterinary care can be administered. The St. Tammany Parish Sheriff’s Office K-9 Division is composed of six K-9s - five dual-trained narcotics/search K-9s and one search K-9 - and their handlers. A seventh K-9, a Labrador, is used by the Highway Enforcement Unit to search for narcotics in vehicles on our local highways.